Featuring Amelia’s story “Emergency Room Prayer” and how God miraculously answered a desperate plea for help during her husband’s trip to the emergency room, Chicken Soup for the Soul: Devotional Stories for Wives will inspire, uplift, and counsel any woman of faith who needs a boost or reminder of God’s ever-present love as she goes through the ups and downs of daily life and marriage. 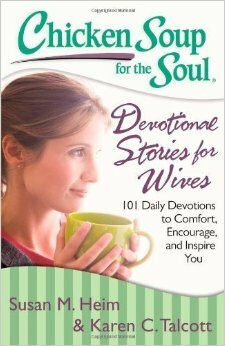 This collection of 101 unique devotionals – consisting of a scripture reading, a Chicken Soup for the Soul story, and a custom-written prayer by women of faith – will affirm God’s unconditional love and His wisdom. Women will find solace and strength in these stories that cover everything from everyday trials to tests of faith.